On behalf of the Peoria Assn. of Pastors, I would like to take the time to welcome Dr. Michael Eric Dyson to the Peoria community. 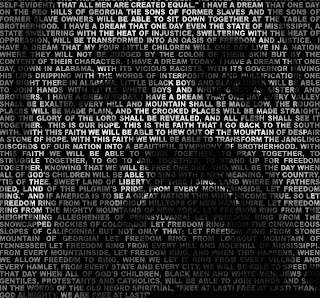 His work and dedication to civil rights and issues that effect people of color, not only in America, but internationally, is not without notice or high regard. We are certainly honored to have him in our community. It is unfortunate that Dr. Dyson had to come to Peoria as a fourth choice and on the back of a threatened boycott. Forest Whitaker was originally scheduled, followed by Tavis Smiley. Under normal circumstances a boycott and civil rights would go together handsomely. However, in this case the threatened boycott was raised by a group of Peoria women calling themselves The Colored Ladies Book Club who committed to protest Tavis Smiley's appearance at the luncheon in which he would be featured. Certainly the game of "political correctness" from Peoria's black democratic elite is in full effect. Evidently the Colored Ladies Book Club believed that criticisms directed toward out nations first Black President are anathema and anyone doing so should be condemned and boycotted especially if they are black. 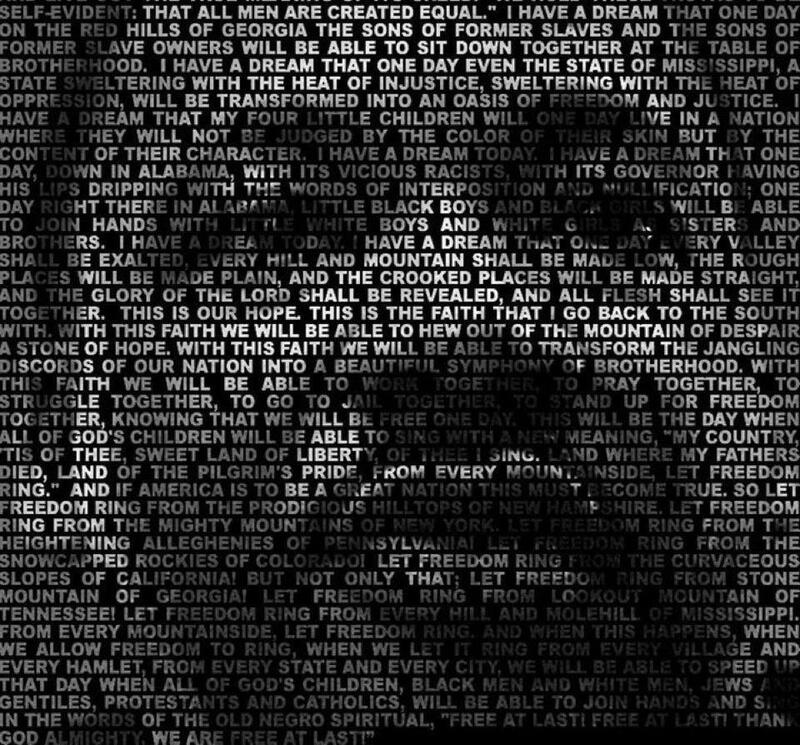 Does Stifling Accountability Toward Political Officials Uphold The Legacy Of Dr. King? 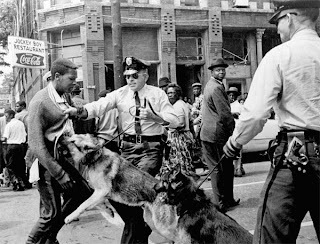 I began to wonder, in light of all of this, is this really the vision of civil rights and freedom that Dr. King fought for? I couldn't imagine that Dr. King would not have spoken directly to a government in which the President was black, latino or otherwise who failed or underperformed in delivering help to a suffering community. However it seems that Peoria blacks, the Colored Ladies Book Club in particular, care more about public appearance and the facade of "black unity" rather than addressing the real pains, hurt and despair of people at ground level. Secondly, after all that black people have suffered historically at the hands of racist whites and unfair and imbalanced laws created by racist whites in order to oppress, I simply can't imagine an organized boycott (threatened or real) against a spokesman and leader of the black community simply because that person held true to the civil rights commitment of speaking to power, and holding governmental officials accountable for their actions. I couldn't imagine former NAACP leader of Peoria, the late John Gwynn, boycotting black people for voicing their opinion on issues to the highest degree and at the highest levels. Speaking to power and holding officials accountable for their actions is the heart of the civil rights movement. Simply because our President is black should not, in any way, give him a free pass to overlook the needs of the black community or respond to the same ones that paved the way and helped him get elected. We remember that when our President was running for office, he was front and center in the black community and every black church. He was at almost every denominations major convention, asking for support, stating that the time to life the black community had come. 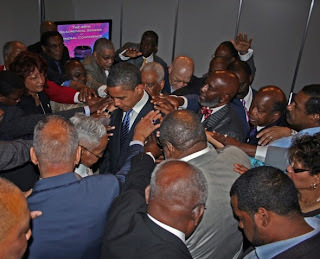 Religious leaders bought it all, hook, line and sinker and gave themselves to photo shoots and opportunities to communicate that we were making history by electing our nations first black President. I even remember Peggy Joseph, an Obama supporter, naively assuming that because Obama had been elected President that "I won't have to worry about puttin' gas in my car, I won't have to worry about payin' my mortgage, y'u-know, if I help him, he's gonna help me" The promises of hope were high and the expectation was that because a black man was President that he was supposedly "in touch" with the needs of the black community that the black community would be especially benefited as a result. Well we all know that was sheer fantasy. When the financial crisis began to impact the country, Peoria and surrounding communities adopted the "It's Better Here" campaign to seduce people into believing that Peoria was some sort of national anomaly and that increasing unemployment, investment and savings loss and increasing rates of poverty didn't effect Peoria as much as the rest of the country. The campaign was later dropped because the reality was that Peoria was by certainly and no means exempt from the ills that the nation was suffering and is yet suffering. Within the black community that suffering is especially poignant. I would think that those in "black leadership" would certainly know these things and be on the front line petitioning governmental officials for relief and holding them accountable for taking the votes and running. unfortunately, that doesn't appear to be the case. To prove my point, let's just look at Peoria County for a minute to see if the Colored Ladies book Club has read how their fellow Peorian's are faring in this economy. According to the US Census Bureau 2008 American Community Survey, blacks were almost 21,000 of Peoria's population. The unemployment rate was 9.4% compared to whites which was 3.7% out of an estimated population of 115,600. In 2009 the unemployment rate doubled to 18.2% for blacks and 7.8% for whites in the Peoria County area. In 2010, out of an estimate of 23,000 blacks the unemployment rate increased again and was 20.7% Comparatively, unemployment among whites during the same period of time from 2009-2010 rose less than 1% to 8.3%. Although both were increases exceeding 100%, over 2 years (since President Obama was in office) the numbers indicate that 2 out of every 10 black people in Peoria are unemployed, while 1 out of every 10 whites are similarly situated. Neither number is good, but blacks are certainly effected heavily. In Peoria County the same survey estimates that in 2010 37.9% of blacks lived below the poverty level compared to 8.6% of whites with an overall average of 14.3% of citizens living below the poverty level. This was up from 32.9% in 2008 for blacks and 4.7% for whites. I won't go further to as to bore with details of and national rates of unemployment and poverty among blacks, but as bad as it is among whites, it is worse among blacks. Advocates can say that President Obama took over a sinking ship and without his intervention it would be worse. While both of those things may be true, none of those things are an excuse for why anyone should simply allow the President to remain unaccountable for fulfilling his promises to America and the black community which he rallied heavily in order to be in office. The Colored Ladies Book Club would have been better served to boycott, institutions such as Bradley University who's minority management numbers are questionable, Methodist, OSF and Proctor Hospitals who also don't seem to have minority development or recruitment programs for upper level management, Ameren CILCO, CAT or any number of employers who can do a better job of minority recruitment by opening apprenticeship training and minority development programs for all levels and classifications of employment. Instead Peoria threatens to boycott a diverse voice and opinion arising out of and centering on its very own community. A voice with a proven track record of speaking to pertinent social and political issues. This is the unfortunate style of Peoria and the unfortunate condition of certain black leaders within Peoria. No wonder some of us feel that crumbs are good....unless, they are crumbs on OUR table. This President was elected on the back of the black church and black people who voted simply because they thought progress had been made by electing a black President and some of us just wanted to have something said positively regarding our actions on this side of history. The facts are these however, under his leadership, the black community has received no abnormal benefits or gains but has received more extraordinary pains. ~ In Chicago, IL. during the 2008-2009 school year, about 27 Chicago Public School (CPS) students lost their lives to crime and violence. If that weren't bad enough, during the 2009-2010 school year over 37 (CPS) children were murdered. When Obama was elected did he even ONCE look back and do something about any of this? ABSOLUTELY NOT! What he has done is cater to the homo-agenda, claiming that homosexuality is a human right and other notions of the extreme liberal left...cowered to religious pluralism, and even upheld not defending laws such as DOMA which were instituted and established lawfully by representative process. In light of the anti-boycott sentiments against Tavis, who simply asks the President to be accountable to a group of people that he will invariably wine and dine and woo, I would like to know what HAS Obama done for the black community??? The thought that anyone, who has the public's best interest at heart, would not recognize the absence of this President as it pertains to issues of importance among blacks and American citizens in general, leads me to believe that they themselves need to be "boycotted". Such onlookers and supporters cannot possibly be thinking of and catering to the reality of the thousands unemployed (over 33% in some census areas of Peoria) and living in poverty (over 40% in some census tracks). For these issues, we don't need "clone" leaders who are dedicated to the establishment simply because it looks good and serves their purposes. We need leaders and voices that will challenge the establishment and demand higher standards of accountability. One thing we can see is that Peoria black leadership hasn't arrived nor adopted standards demanding excellence, but simply sold themselves out for photo-ops and novel popularity. Put it on record that this person, whether one deems him leader or not, HAS NOT and REFUSES to cower to the sentiments of them that would rather window dress issues and pretend that things are well when they are not." Tavis Smiley & Dr. Cornell West Outline The Problem. Can Any Rational Person Disagree? Well said Pastor Burnett. There is no denying the facts about the poverty, crime and homelessness of Peorians (especially black). I don't care for Tavis, but during his current Poverty Tour he appears to be a lot less critical of the man and focusing more on the policy and issues. I guarantee you, Mr. Dyson has a low opinion of "colored people" in Peoria, as a result of how they handled Tavis (his compadre). I think they will find that he is going to certainly spank some folks from the podium. When we try to subdue voices coming from our community we have underminded the whole spirit of civil rights. This isn't a communist or socialist society whereby all voices are submitted to some authority before they are passed to the community. In addition, having a black President means nothing if issues pertaining to blacks aren't addressed. Then to "threaten" boycott because you don't like the position that black leadrs have on issues pertaining to black people is ridiculous for all the reasons I mname in the article and then some. Jusst because people have done certain things for so long doesn't make what they are doing right. Black leaders in Peoria have done certain things for a long time. Some good, some bad, but they don't get a pass simply because they are black. They too should be held accountable.